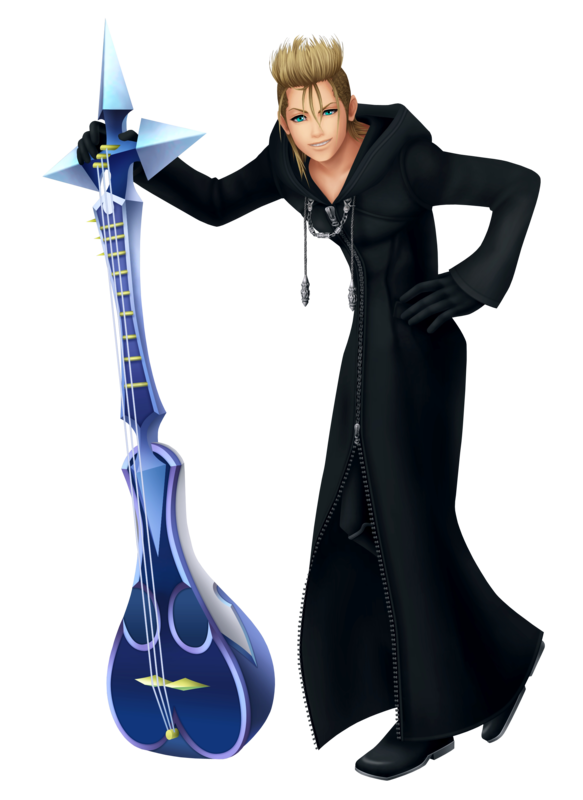 Demyx is a bit of an anomaly in Organization XIII; unlike his peers he shows a tendency to run away from responsibility and conflict and would rather be playing his sitar, Arpeggio, rather than making sure Sora is on par with the Organization's plans as per Xemnas' orders. Demyx's first appearance is at Hollow Bastion with his Organization mates as Xemnas makes the group known to Sora and co. for the first time. Demyx's edgy, reluctant disposition comes through his nervous laugh as he, along with his peers, laughs at Xemnas' dry humor. Unlike Xigbar - with whom Demyx is seemingly on good terms with - Demyx chooses to go on his way after this encounter as quickly as possible. Since Demyx is quite lackadaisical about his position in the Organization, it is Xigbar's suggestion that Demyx be used to "liberate Sora's true disposition" that lands Number IX in the realm of the Lord of the Underworld Hades, the Underworld at Olympus Coliseum. After a talk with Hades about Sora and friends goes down badly, Demyx flees and rushes past Sora's party, crying "Run! Run away!" before leaving. In spite of this, Demyx returns to steal the Olympus Stone, an object which the gods use to keep their strength in Hades' domain. It is this object that Sora and friends seek; consequently Demyx is accosted when they find him during their search, and he is forced to do battle. Though his control over his water attribute is strong, he quickly loses and chooses to make his exit rather than continue the fight. Neither hide nor hair of Demyx is seen until sometime later at Hollow Bastion, where the Nobody waylays the gang of heroes. Sora's comment about Demyx's cowardliness is hardly unforeseen given his habits of avoiding conflict, but surprisingly Demyx decides to prove how wrong Sora is and once again throws himself into battle, though this time his powers exceed those of his time in the Underworld. After an intense, long battle, Demyx finally meets his end like a true Nobody and after lamenting his loss, he disappears into nothing. 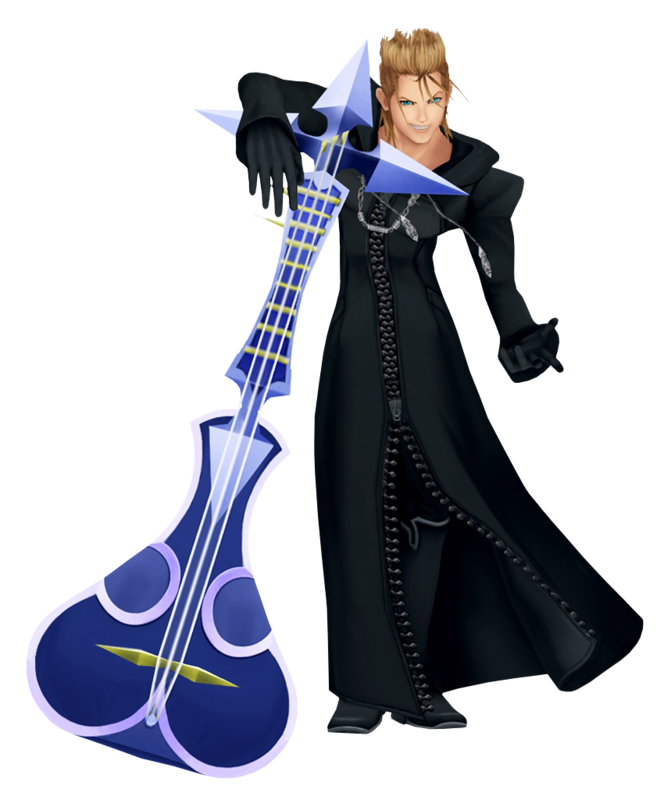 The most care-free and least serious of Organization XIII, Demyx is Number IX, a young and lazy sitar player who uses his instrument to control water. Though he is quite a ‘scaredy-cat' by definition, like all of his fellow members he acts upon human memories and can truly feel nothing at all. However, he would rather don his laid-back persona in lieu of his serious one since he doesn't like missions where combat is involved. When he does have to fight, he will often dump his responsibilities on his mission partner, and is seen manipulating Roxas to do his share of the work on some of the missions they do together; when Roxas comments on it to Axel later on, Axel defends the Melodious Nocturne and says that he "specializes in recon". When not on missions, Demyx is seen playing his sitar at the Gray Area and seems to be close friends with Xigbar - close enough that he can call him ‘Xiggy'. It is Demyx's amiable nature that puts him on good terms with Axel and Xion, the latter of the two who he often teases. He is also deathly afraid of Larxene, thinking of her as cruel. When news gets back that she has been eliminated, Demyx is in a good mood, showing that even he can be unkind. However, his own elimination comes not long after Roxas leaves the Organization and Demyx's colorful personality shines no longer. The rumours that Demyx specialises in recon because he isn't much of a fighter aren't entirely untrue, and neither is it untrue that he would rather sit a fight out. However, when fighting, Demyx is surprisingly quite potent, with a physical impact that will leave you with painful bruising for a few days which he can dish out at a good, even pace. Though his defence is his Achilles' heel, he keeps harmful enemies at bay with extreme magic, summoned by his beloved sitar, Arpeggio. Arpeggio's true potential is realised when Demyx activates his Limit Break, Wave Gigs; with it, he smashes through blockades with his aquatic attribute as he rocks out, sending up formidable geysers of water that will blast even the sturdiest of fiends away.